Here we going to see about the types of visa for working in USA. There are several different visa types for the foreign nationals who wish to work in USA. The type of Work Visa you obtain will depend on your eligibility to work in USA, your US employer, your employment status (temporary or seasonal) and the type of work you do. Let’s have a look at different types of work visa available for USA. The United States of America welcomes thousands of foreign workers in multiple occupations or employment categories every year. These include the position for artists, researchers, cultural exchange, participants, information technology, investors, scientists, athletes, nurses, agricultural workers and others. All foreign workers must have permission to work legally in USA. Every employment category has different conditions, requirements, and authorized periods of stay. Anyone who violates the terms and conditions would strictly be removed or denied of re-entry in to USA. Here’s more information on types of work Visas for USA including eligibility and requirements. USA Exchange Visitor (J-1) non-immigrant visas are available for the individuals approved to participate in the study based or work based exchange visitor programs. In short, United States supports International education and welcomes foreign students and exchange visitors. Students and exchange visitors must be accepted by their schools or program sponsors before applying for visas. The J-1 Exchange Visitor Visa Program currently falls under 13 different exchange program categories. 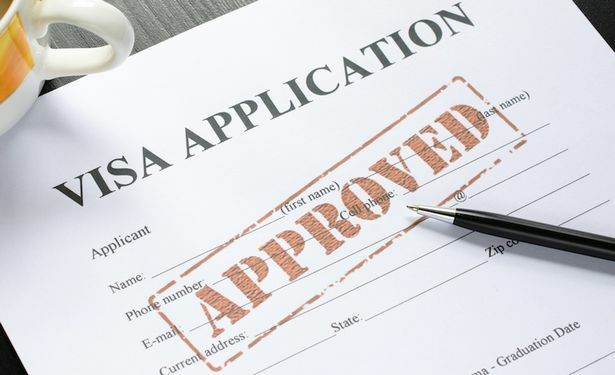 Depending on the particular category, a Visa obtained under J-1 Exchange visitor program will allow any foreign national to work, train or travel legally around USA. It benefits the US businesses by providing them with seasonal and other staffs. USA temporary non-agricultural Visas (H-2B) are available for the foreign nationals in the non agricultural fields to work in the United States. For example, these visas are provided for the jobs at Ski Mountains, amusement parks or beach resorts which are temporary in nature and non-agricultural. There is a limitation, or a “cap” placed on the number of workers allowed to enter the country with H-2B visa every fiscal year. Generally these visas are valid for one year but can be extended up to a maximum of three years depending upon the condition. US H-1B non-immigrant visas are for the skilled, educated individuals employed in certain organization. H-1B Visa allows an individual to temporary work for a specific employer. In other words, if you are travelling to USA to perform services in a pre-arranged professional way for a US Employer, and then you can seek H-1B Visa. To qualify, you require a bachelor or professional degree in the specific area in which the employment is offered. Other qualifications are the employee must be able to speak and read English. The jobs are generally in the areas of Engineering, Mathematics, architecture, etc. Around 65,000 Visas are issued every year. Non-profitable organizations are excluded from the annual cap. H-1B Visas are issued for a period of 6 years. Till now, we saw the Temporary Visas, now lets take a look at Permanent Work Visas. Any individual may be eligible for this type of Permanent Work Visas if he/she has an extraordinary ability, or an outstanding professor or researcher, or a multinational executive or manager. But however, each category has certain requirements that must be met. These types of Visas are called as Employment Based Immigration Visas. Other categories like Green card can make any foreign national to be the permanent resident of United States through a job or an offer of employment. Another way to get the permanent Visa is to apply for Green Card Lottery. Every year around 50,000 Green cards are issued to the potential immigrants of USA. This scheme randomly selects the applicants through lottery system. Hope this information is quite useful. Don’t forget to share on Facebook, it will be useful to others like you and Subscribe Here to get more tips. This is new information to me.. Sounds pretty much good article.. Thank you nirmal. Thanks for stopping by. Glad you like this post. Keep on reading my blog. From a long time I was planning to persue my higher studies from America. And this guide is perfect for me. Thanks Nirmal for sharing this ultimate article.